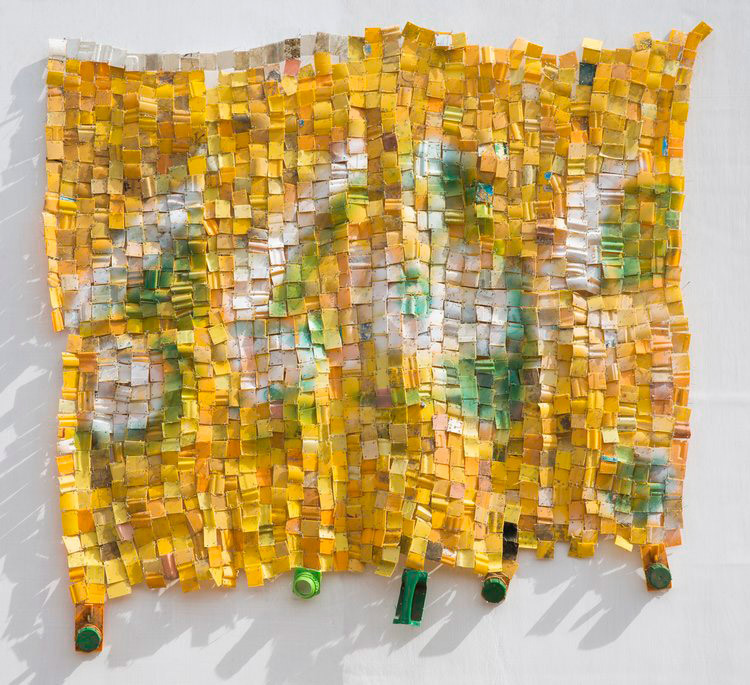 Jane Lombard Gallery is pleased to announce “Differences between”, a solo exhibition by Ghanaian artist Serge Attukwei Clottey. The exhibition centers on the artist’s assemblages made from used jerry cans, a part of his extensive work that includes performance, photography, painting, sculpture and social practice. The artist will present a special one-night performance in conjunction with the exhibition opening. Rooted in colonial, ideological and material exchanges, Attukwei Clottey fervently integrates evolving narratives of migration, consumption, and cultural coexistence in a movement he calls Afrogallonism. Afrogallonism originated after the artist’s decade-long work with the ubiquitous 20-25 liter yellow containers, most commonly referred to as Kufour gallons, in Ghana and West Africa. Imported from Europe containing oil they are endlessly reused to carry potable water by those struggling with the country’s shortages. Attukwei Clottey is attentive to the gallon’s physicality and color as they occupy spaces where there is increasingly less use for them. His process transforms the vessels through cutting, painting, arranging and stitching. Works in the exhibition follow a chronology of the African Continent and diaspora; behaving as symbols of displacement, the 2015 “Slave Ship” series abstract and reconstruct diagrams of the slave trade into his emblematic plastic tapestries. Together with his latest work, they document a journey toward an unknown, demonstrate varying cultural orientations and provide conceptual blueprints for the recovery of person and nationhood. The artist deems it crucial for his work to have a close relationship to his community before it is experienced abroad. His practice considers the history of the cast-off material, valuing its staple role in the water economy while re-contextualizing familiarity into contemporary art and performances illustrating stories of postcolonial identity. Garnering accessibility through their inherent connection to textiles, mythologies and every-day life, they act as a link to indigenous practices and modern necessity, embracing the challenges of developing societies. 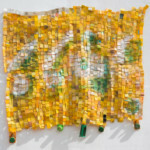 The Afrogallonism movement – now established and adopted by Attukwei Clottey’s GoLokal collective based in his home-town of Accra – reflects the material as a symbol of Ghana’s water scarcity and embodies the object’s charged meaning in Africa’s history and as the foundation of its future. Due to the gallon’s functionality, GoLokal collects discarded ones on beaches and dumps to create objects beyond artwork, such as furniture, masks, and dwellings. In this approach, Attukwei Clottey not only elevates traditional practices used by his community to survive every single day but also engages an environmental issue; preparing for a theoretical future in which Ghanaians no longer have to hunt for water. Serge Attukwei Clottey (b. Accra, Ghana, 1985) lives and works in Accra, Ghana. Attukwei Clottey has exhibited at the Depart Foundation, Los Angeles, CA; UTA Artist Space, Los Angeles, CA; We Don’t Contemporary Festival, Hamburg, Germany; The Mistake Room, Los Angeles, CA; 27th Festival Les Instants Vidéo, Marseille, France; Werkstätten-und Kulturhaus, Vienna, Austria; 11th Biennale de l’Art Africain Contemporain, Saint-Louis and Dakar, Senegal; University of Amherst, MA; Nubuke Foundation, Accra, Ghana; Du Bois Centre, Accra, Ghana; Stedelijk Museum, Amsterdam, Netherlands, Haverford College, PA and the Goethe Institut, Accra, Ghana.